At Ringwood Hall Hotel, we pride ourselves on bringing our guests enjoyable and entertaining events throughout the year – and June is no exception! You can enjoy a stylish evening of canapés and `bubbly` on arrival, a mouth-watering four course dinner by romantic candlelight and, of course dancing to your heats content to the melodies of our popular Club Tropicana Disco until the late evening if you wish! Our `Downton`. 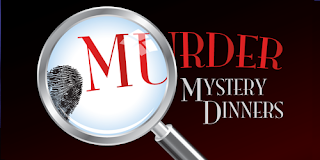 Murder is not a laughing matter - but this Murder Mystery evening is full of fun and banter……a humorous plot with twists and turns along the way. All tickets £29.50 and include the performance and 3 course dinner. What better way to treat Dad’ this Father’s Day than a traditional Sunday Lunch at Ringwood Hall Hotel. Come celebrate with your family and enjoy our relaxing and comfortable atmosphere, with background pianist and even face painting to keep the children in the party entertained. Who can resist the charms of the Caribbean culture? Step into a world of colour, style and fun with our Caribbean Cruise evening on the 27th June, in the Ringwood Suite. For those that have travelled to the Caribbean, step back into your memories on this wonderful evening – and for those yet to travel – come experience the atmosphere from your doorstep, where you will enjoy canapés & bubbly on arrival, with a four course dinner and dancing `til late to Club Tropicana Disco. Plus tickets now available for our Strawberry Tea Charity Event for Breast Cancer Care in our marquee on Sunday 19th July 2-5pm. Advance tickets only. Call Sara on 01246 280077 to book one of our brilliant events today! QUICKLY BEFORE THEY ARE ALL SOLD OUT! Don't miss Ringwood Hall Hotel’s next Wedding Showcase event which is THIS weekend, Sunday 17th May, between 2-5pm! The May showcase is the first opportunity for you to view our luxury wedding marquee, fully dressed and a perfect choice for summer weddings (available until September) and situated within our stunning 29 acre of landscaped gardens and meadows – making it the perfect destination for a country-theme wedding! Don't miss our wedding showcase, 2pm - 5pm on Sunday 17th May – Totally free and we even offer a glass of chilled bubbly on your way in! Ringwood Hall Hotel’s next Wedding Showcase event will be on Sunday 17th May, between 2-5pm and are the perfect opportunity for Bridal Couples to visit our stunning hotel and meet with a collective of professional wedding suppliers all in one day. This wedding fair is also the first opportunity for bride and grooms to view our luxury wedding marquee, fully dressed and a perfect choice for summer weddings (available until September) and situated within our stunning 29 acre of landscaped gardens and meadows – making it the perfect destination for a country-theme wedding! If the weather is nice, why not take the time to have a stroll around our secret woodland walk, (next to the Marquee), which was recently discovered and restored to a magical hideaway with tasteful lighting - making it a perfect setting for your photographs! Click here to read more in our latest Marquee blog!